Just trying to finalise our arrangements for our holiday in Indonesia. Working out prices is rather complex, as we're trying to think in several currencies simultaneously. And since exchange rates are fluctuating quite a lot day by day, it's not easy. Alternatively, a million rupiah is US$102, HK$795, €75, or £59. Naturally. So I had lots of fun at Chung King Mansions on Nathan Road in TST yesterday, checking out the rates at all the exchange places (by the way, don't believe the boards!) 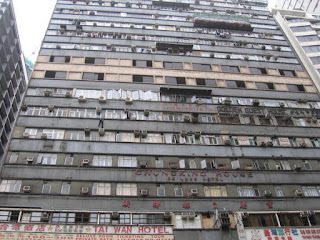 Chung King Mansions claims on the outside that it is a "de luxe hotel" but in fact it's a complete dump. Loads of hostel-style accommodation, crammed into a rather insalubrious-looking building. We want to travel around a bit between Java and Sulawesi, and Lion Air has the cheapest fares. However, tickets cannot be booked online, i have called the "friendly bilingual call centre" about 14 times today, and variously had the phone put down on me, got a message in Baha Indonesia, or the line just fizzled out. I can't buy tickets from the office in Singapore, because we need to collect them, there are no Lion Air offices in Hong Kong. Ross got through on the phone, but the only way to pay for your tickets is through an Indonesian ATM. Obviously, there aren't many of those here either. So, we'll just have to hope for the best and book when we arrive! The idea is to fly to Jakarta, then fly straight to Yogyakarta to see Borobudur and Prambanan. Then we'll fly to Makassar on Sulawesi (oh, another complication, seems like most places in Indonesia have more than one name, or at least two spellings if they only have one name). Bus to Tana Toraja for a few days, bus back to Makassar, then fly to Manado, where we get a ferry to Pulau Bunaken for some snorkelling.